Item # 280178 Stash Points: 3,499 (?) This is the number of points you get in The Zumiez Stash for purchasing this item. Stash points are redeemable for exclusive rewards only available to Zumiez Stash members. To redeem your points check out the rewards catalog on thestash.zumiez.com. Part of Dakine's Method Series, the Bronco snowboard gloves feature the highest level of breathability and waterproofing due to their GORE-TEX inserts. As an added bonus, the Bronco's high-loft insulation makes for a streamlined design while a DWR treatment on the shell material adds an extra defense against moisture. Shred all day with Dakine's Bronco snow gloves keeping your hands warm and dry. 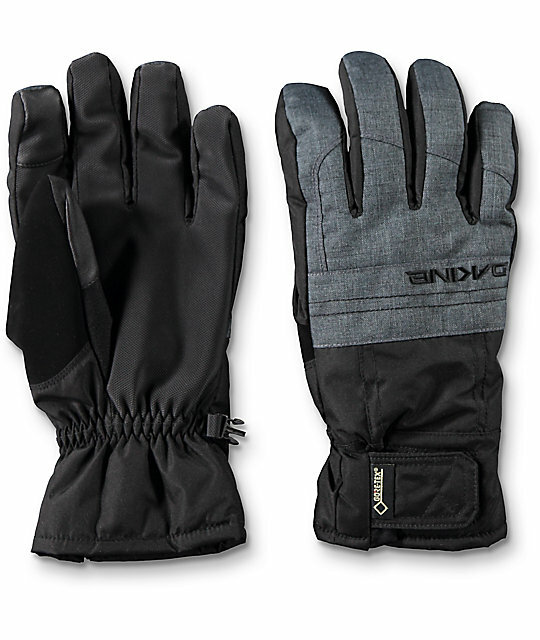 Bronco Carbon Snowboard Gloves from Dakine. High Grip PU Palm: A durable, water-resistant, synethic palm material. High Loft Synthetic Insulation: [60 - 110g] A low-profile and lightweight insulation that resists moisture in wet conditions while trapping in heat. Dakine Warmth Index: 4 out of 5. GORE-TEX® Inserts: Highest level of waterproofing and breathability available for long-lasting weather protection and optimal moisture & heat management. Liner: 400g Heavy-weight pile at palms to maximize heat retention while 300g fleece at the fingers and wrists provide warmth without sacrificing mobility.